This is the case every iPhone 6/6+ owner has been waiting for! With both models giving great levels of protection from both drops and water. The AquaTiks slim profile and protection make it highly desirable for those who love the slim profile of their iPhones, while the TakTik provides the rugged protection we have seen from the previous models iPhone 4/5/5s. 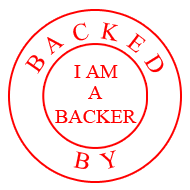 I have backed project created by LunaTik Labs on Kickstarter before and I can attest to their quality! If you decide to back them, please leave a comment on their campaigns comment page that you found their project through IamABacker.com , Thank you. In 2012, LUNATIK raised the bar for device protection with TAKTIK Extreme. We believed that consumers aspired to better quality accessories for their valuable devices than what currently existed on the market, and we were right. Since then, TAKTIK has successfully protected thousands of iPhones for those who rely on their gear—people who serve in our military, police, firefighters, skydivers. Users who won't settle and whose hobbies, passions, jobs or lives depend on having the best gear available. We care deeply about making products of the highest quality possible and are grateful to have an incredible community of uncompromising users to help inform our products. Now with the launch of the new iPhone 6 and 6 Plus, we've raised the bar again. Introducing TAKTIK 360 and AQUATIK, our most advance device protection ever. Creating a fully submersible waterproof case that doesn't compromise the design and use of the iPhone is no small feat. We've designed airtight compression closure systems for both TAKTIK 360 + AQUATIK that protect from water and dust to an IEC rating of IP68. That means with all ports and membranes closed, your iPhone will stay safe and dry for up to one-hour in water as deep as two meters. Stay connected while you take a worry-free swim in the pool or venture down the river in your kayak with confidence. Let's face it. Every now and again, sh*t happens. The new iPhone is sleeker and slimmer than ever, but with its smooth rounded corners and larger screen, it is highly susceptible to accidental slips and drops. Whether your phone falls out of your pocket into uncharted toilet bowl territory or down the side of a mountain, TAKTIK 360 + AQUATIK are designed to protect from life's unexpected moments. The dangers of not using protection are clear. On average, 2 out of 3 smartphone users damage their phones. Repairing or replacing a damaged phone cost you time, money and potentially valuable data. Why risk it? Use the proper protection and enjoy your mobile life with confidence. Some of you've asked if we will be offering TAKTIK 360 and AQUATIK for iPhone 6 Plus. The short answer is not right now. For the duration of this campaign, we are focused on manufacturing and shipping product for iPhone 6. Though we are currently in development on 6 Plus offerings, they will not be included as a a part of this campaign. However, you can sign up to be notified on product news and release dates here: TAKTIK 360 for iPhone 6 Plus and AQUATIK for iPhone 6 Plus. NEED PROTECTION WHILE YOU WAIT? WE GET IT. Redefining protection doesn't happen overnight. Developing and engineering cases as complex and protective as TAKTIK 360 and AQUATIK take time...and we're not cheaters. We got the iPhone 6 data the same day you did, and we've been hard at work ever since. From development and tooling to testing and obtaining IP68 and MID-STD-810G ratings, we are committed to designing the best products possible. That will take a few months. However, we can appreciate that you want to get your device protected as soon as possible. That's why we're offering to ship you our brand new SEISMIK case for iPhone 6, FREE of charge while you wait. Inspired by the airless tires on military vehicles, SEISMIK's shock-absorbing perimeter guards incredibly well from unexpected impacts and drops. So well, it actually bounces on impact. LUNATIK exploded onto the global tech scene in 2010 with TikTok + LunaTik watch kits and essentially sparked the global crowd-funding movement. Since LUNATIK's inception, we have positioned ourselves as a premium lifestyle brand that consistently challenges convention and exceeds consumer expectations. Led by award-winning design entrepreneur Scott Wilson, founder of Chicago-based design and experience firm MINIMAL, the team has a proven track record in bringing disruptive solutions to market. We care deeply about making the best products possible and are grateful to have an incredible community of uncompromising users to help inform our products. Users who won't settle and whose hobbies, passions, jobs or lives depend on having the best gear available. No design is perfect. The quest for ultimate protection is an evolutionary, iterative and expensive process, and we've been continually learning, refining and pushing the limits since TAKTIK was first introduced for the iPhone 4s. We are small design company, not a billion dollar case brand that has unlimited resources and distribution. With your support, we are focused on shipping TAKTIK 360 and AQUATIK in Q1 of 2015. We are truly excited to share this journey with you. As we move further into the campaign, we will be providing frequent updates and insight into our development process. We value the journey as much as the final product and hope you do to. Products still in development, some features are subject to change.